It's a beauty! Here is a fillet brazed 26" wheeled touring bike that is ready to travel. It's loaded with cool stuff, and is now for sale. This bike was seen at 2012 North American Hand Made Bicycle Show in Sacramento, California. Frame size: 575mm top tube and 600 mm seat tube. The standover with 2.0" tires is 860 mm (slightly less than 34"). 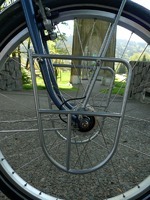 Seat tube angle is 73 degrees; head tube angle 72 degrees; fork rake is 60 mm and trail is 45 mm. This bike has traditional tubing diameters (1" top tube and truss; 1 1/8" down tube; 1" threaded fork steerer). The truss top tube is for added stability from the front to the back of the bike when the bike is loaded. Bike comes with a large Carradice seat bag. The bag has a small support rack to stabilize it. Between 4 panniers and the large seat bag, this bike has serious carrying capacity (Panniers not included). New-old stock XTR front & rear derailleurs, and XTR rear 9 speed cassette hub. Front generator hub which powers both the front and rear lights. Gilles Berthoud leather saddle; high polish seat post by Paul Components, and Berthoud stainless fenders. Last but not least is the silvery blue paint. It's a thin wet paint that is a near perfect match of the blue-gray highlights on the vintage XTR derailleurs. It's a gorgeous finish, pleasant and understated. Large Size Seat BagA lot of thought went into the design of this bike. It would make a great randonneur, light touring or fully loaded touring bike. It has excellent functioning parts that are durable, and are nice to look at. This bike is going to fit a person who is between 6' and 6' 3" and it's safe to say, it's going to make someone very happy for years to come. Here is a gallery with other photos of the bike. © Ahearne Cycles. All rights reserved.